Get insider secrets to avoid costly blunders on the most important investment of your life. HGTV has brought together some of the top real estate experts to compile the definitive list of the biggest mistakes we all make when buying and selling our homes. Do not buy a house based on its current decor. Remember that you are buying the house, not the stuff inside of it, so make sure you see beyond the decorations and look at the bones of the home. Focus on the floor plan and the square footage. You also might want to measure the dimensions and graph out how that's going to work with your current belongings. Make your house easily accessible to potential buyers. If there's nowhere to park or it's difficult to get into, buyers may just skip it and look at someone else's property instead. It's absolutely critical that you research the neighborhood before you buy. Check out the area, amenities and the school system to be sure that your address corresponds with the correct school district. Also attend a community meeting, if possible. You're not just buying a house, you're buying a piece of that real estate and the land around it. While the starting bidding price for a house on auction might be a good deal, it doesn't mean the final price will be. Make sure that you are very strict with your budget when you are bidding — do not go over your final price because you got wrapped up in the excitement of a bidding war. Another thing to keep in mind is that when you buy a property at auction, you aren't able to get any of the warrantees or guarantees, and you are not able to do a home inspection. Find out if the auctioneer is going to put those charges on top of the sale price as well as if there are any liens on the property. You could be responsible for paying the property taxes on that house you just bought, which could make what looks like a good deal into a really bad deal. If you are selling your house, you really shouldn't be around at the open house. You might want to try and sell the place on all the reasons you think the house is great, but that might not translate to the buyer. If you leave, you allow the buyers to really give unbiased objective feedback to the agent, which is only going to help you in the end. You don't have to wait until the weather is nice to put your home on the market. That's a common real estate myth. Spring is the time of heaviest real estate activity, but that does not mean that people don't buy houses 365 days of the year. That doesn't mean you can't emphasize your home's seasonal amenities. When the real estate market is really hot and is appreciating really fast, people tend to look at it like it's the stock market. But playing real estate is nothing like the stock market — when you invest in real estate, you really need to take a long-term approach. Don't market your home with just a for-sale sign. Explore other marketing tools as well. Talk to your real estate agent about the marketing that they will do. It's something that should be set up from the initial signing of a contract with an agent. Some homes have virtual tours and photographs online. If you choose to go that route, don't forget to include the floor plans. That way, people can see the layout of your home and know that if it it's right for them. When you are decorating and renovating your home, you need to think about what is going to appeal to a broad section of buyers when it comes time to sell it. Buying houses and being in the real estate market is like chess, you always want to look two or three steps ahead in the game. It's really easy to buy a house without seeing it because of the Internet and virtual tours, but virtual tours can be deceiving. Plus, it's really hard to actually get a sense and feel of a home by only looking at it online. You need to actually walk through the place yourself. If that's just not possible, hire an inspector to go look at the property and provide you with an assessment. Don't assume every ad is fact. Learn to decipher real estate lingo. For example, cozy means small, and as-is means it's a fixer-upper. If there are a lot of exclamation points in an ad, it means they are there just to take up room because there is so little to say about the place. Follow the old adage: If it sounds too good to be true, it probably is. Treat meetings with agents like a job interview because that's really how it works — that person is going to be working for you. Talk to your friends who've sold houses and had a good experience with their agent, and go to open houses and observe how that agent interacts with other people. It's also a good idea to meet with the agent in their office. It allows you to see how organized they are, what kind of environment they work in and whether that's conducive for them being able to do a good job for you. There's a lot more to selling a house than just putting a sign on the front lawn. If you don't have an agent, you will not get on the multiple-listing service (MLS). That means that other agents are not going to know that your property is for sale. Another thing to consider is if you are willing to show the house each time someone wants to come by and look at it? If you do plan to sell your house on your own, always have a lawyer present at a closing. It's really important to have someone on your side who understands all the complexities. The most expensive house will only depreciate in value over time, rather than appreciate, which is what you want. Also, those houses are often not the first house to sell because they are usually overbuilt to the neighborhood. It's absolutely critical that you research the neighborhood before you buy to find out what the price point should be. Just because the bank pre-qualifies you for a loan amount of $400,000 doesn't mean you can afford to make that payment every month. Before hitting the streets for a house hunt, you should sit down and make a monthly budget of what you spend every month. Come up with a number that you are comfortable spending on your mortgage payment, aside from those other expenditures. An easy way to do this is to take a third of your gross income and have that figure be the number you spend on the house. It is also a good idea to have six to nine months of mortgage payments in the bank, plus a little extra if you have any repairs that you might need to do. It's important to visit a house more than once because the neighborhood itself may be very different, depending on the day of the week and the time of day. It's also a good idea to go home and think about it, even sleep on it, before you go back again. The best thing to do when going into a closing is to get all the paperwork ahead of time. All that information should come from a mortgage broker or banker. They have what they call a HUD (Housing and Urban Development) One form that lists out all the charges, and you can legally get it in your hands 24 hours before closing. Schedule the closing for in the morning, so you have a fresh mind and plenty of time to go over everything and ask questions. The final walk-through is another imperative part of the process. You may want to have a home inspector accompany you. Don't feel like you have to tackle major renovations before placing your home on the market. Just touch-ups here and there — especially outside the home — typically do the trick. Minor upgrades usually have a higher return on your money than tackling major renovations before placing a home on the market. The main reason? Huge construction projects always cost more than you think they will, and they also take longer than you expect. The best place to spend money is outside. Research shows that increasing the curb appeal often returns the most value on your money. It's what gets buyers inside the house, after all. When you are pre-approved, the bank is saying, "we will give you a mortgage of up to this amount, so now all you have to do is find your home." Some sellers only allow realtors to show their house if someone has a pre-approved letter. That indicates that the shopper really is serious about buying a home. Many homebuyers, particularly first time homebuyers, fall into the trap of falling in love with the very first house that they see. You need to at least look at three more houses in the area to get an idea of what the comparables are in that price range. You want your realtor now to show you homes comparable to what you saw. At the end of the day, re-evaluate. 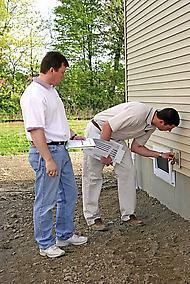 Be sure to hire a home inspector to thoroughly check out a house you are interested in purchasing. There are a lot of things a home inspection can reveal about a property that are not visible to the naked eye. Be sure to hire someone that comes with a good referral basis, that's been in the business a while and knows what to look for. Look up the American Society of Home Inspectors and get a list of qualified home inspectors in your area. Once you find an inspector, insist that they compile a written report, complete with photos. Photographs are important because there are areas a home inspector will go that you might not look at. Buying a home is not just about the money that you spend up front; it's about all the rest of the money you have to spend beyond that. Find out what the property taxes are, what your water bill might be and what a standard electric bill is in that home, especially if you have electric heat vs. gas heat. You also need to factor in furnishings you may need to purchase before you can move in. Look at the space that you are already living in. It will help you to realize what you have been missing and what you need in your next home. Make a list those of needs and then ask your agent to start shopping these needs. On average, Americans live in a house for about nine years. Remember, you can always trade up a few times before you find the ultimate home. As a seller its really important to do your research, and in order to come up with your sale price, look up what comparable homes in your neighborhood have sold for. Figure out what the going price is and try to put yours right in the middle of that, unless you have something extra special to offer. It is always better to price a home sharply than to start too high and have to reduce. Once you reduce, it always looks like something is wrong with the home. Home | More Listings | Featured Neighborhoods | Bacopa Bay Condos | Hidden Bayou Townhomes | Seminole Isle Townhomes & Condos | Townhomes of Lake Seminole | Calculators | Nieruchomosci / Polski Agent | HGTV - Real Estate Tips | Home Styling | For Buyers | For Sellers | About Florida | REALTOR - Contact Anna Z.